An odd thing is the Riksbank’s repeated assertions, if not nagging, about how expansionary the Riksbank’s monetary policy is supposed to be. “A very expansionary monetary policy,” it says in the Monetary Policy Update December 2014, and so said the Governor Ingves at the press conference after the policy announcement. But according to what criterion would monetary policy be expansionary? According to standard criteria, including comparisons with other countries, the Riksbank’s monetary policy is by no means expansionary, but by all accounts quite contractionary. One may ask whether the Riksbank’s repeated assertions are due to ignorance or is an example of disinformation. I would think it would be hard to pin it on generalized ignorance. After all many heads of central banks are either well known academics and/or experienced economic managers. If that´s true, a combined try at disinformation is more likely. For that there is evidence going back at least to the 1930s. Recovery is now under way, but if it were permitted to become a runaway boom it would be followed by another disastrous crash. 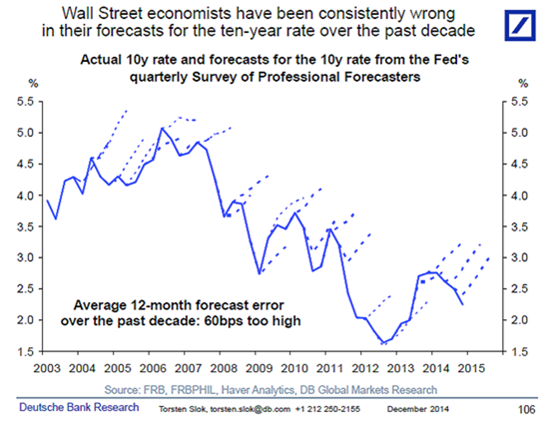 FOMC’er Richard “Inspector Clouseau” Fisher Strikes Again! Richard Fisher, Dallas Fed President and FOMC board member, is peerless. You could make a lot of money listening to Fisher, and investing accordingly, and if so by the opposite direction indicated, that is of little concern to the indomitable Fisher. The latest Fisherism was first unfolded on Oct. 10, when the press-happy central banker regaled The Dallas Morning News with the horror that wages were rising faster than prices in Texas, then an oil-boom state. Except the U.S. has had deflation in unit labor costs for the last half-year. The Bureau of Labor Statistics’ non-farm business unit labor cost index for Q3 came in at 104.015, down from the Q2 reading of 104.328, which was down from the Q1 reading of 105.359, according to the FRED website of the St. Louis Fed. BTW, the index read 103.538 in Q4…of 2008. In six years, unit labor costs are up less than a half-percent. Not annually compounded, that’s total! There is something enthralling about Fisher, who not only is wrong, but perfectly and exactly wrong, like a deaf talent scout at a musical audition. Consider it was Fisher who visited Japan in April 2009 and intoned, “I consider inflation an evil spirit that rots the core of economic prosperity and must never, ever be countenanced.” Yes, he said that…in Japan. Then there was the Fisher personal investment portfolio that went super-short (leveraged short bet, $3 mil or so, maybe more) in May 2010. That Fisherian bold thrust called the market bottom. Set aside the issue of an FOMC board member with a personal investment portfolio super-short on America, and recall the DJIA rallied from there, and Fisher’s money managers closed out his positions with large losses. Not only did the DJIA rally in 2010 coincident to Fisher’s super-short bet, it is up about 80% since then, while the S&P 500 and Nasdaq have about doubled. Or consider Fisher’s advice in June 2008, delivered to the Council of Foreign Relations in New York City. Fisher told the august notables that “though the economy still faces a period of slowdown, or ‘anemia,’ and smaller businesses in particular are likely to feel some pinch from a tighter credit environment…the U.S. will skirt recession,” according to The Wall Street Journal. So, understandably, I am 100% certain that there will be no meaningful wage inflation in the U.S. in coming years. I have comfort stronger than the Rock of Gibraltar: Fisher suggested wage inflation would be a problem. That means wages will be the least of our inflationary concerns, which themselves will be minimal. That is money you can put in the bank. Fisher said so (the opposite, that is). Fisher, an active menace to American prosperity—and perhaps even sanity—will retire next year. Fisher’s disappearance from the FOMC promises sunnier days for Americans, but with one small dark cloud: How will we know what to do, without our infallible Fisher reverse weather vane? The BEA announced in the 3rd estimate that real GDP increased at a s.a.a.r. of 5.0% for 2014 Q3. This was the strongest quarterly growth rate in over a decade. It seems clear that the U.S. recovery is continuing apace and, if the economy is not held back by weak growth in Europe and the BRICS, we should continue to improve. If by “continue to improve” they mean “continue to grow”, that´s right. But it´s a pretty low bar because since the bounce-back from the depths of the Great Recession, real output growth has clocked a remarkably stable (and paltry) 2.2% year on year growth. Keep wearing those rose-tinted glasses and soon everyone will start feeling things couldn´t be better! Note: If things get worse, that´s the fault of weak growth in Europe and the BRICS, having nothing to do with bad monetary policy by the Fed itself. For the Fed, just like high inflation, low inflation is sufficient reason to tighten! Back in 2007-08, headline inflation was high due to an adverse oil shock, but unemployment was low. 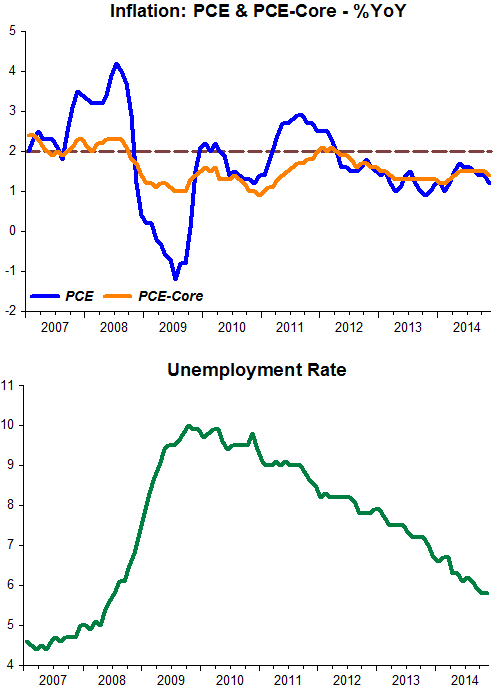 Notwithstanding the fact that core inflation was “on target”, the Fed “tightened” . Now inflation, both headline and core, are much lower than target, but unemployment is falling (maybe for the wrong reasons). 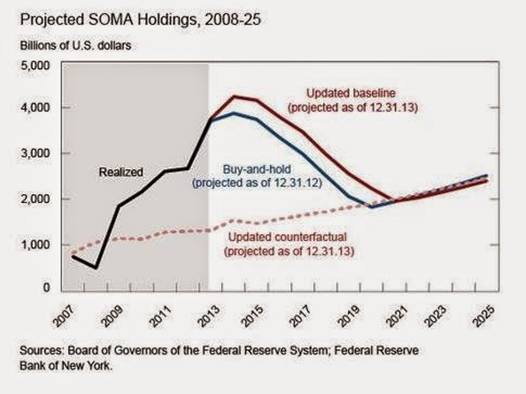 Nevertheless, that´s sufficient for the Fed to again consider tightening! The new inflation numbers alone likely won’t change views inside the Fed, but if core inflation continues to decelerate, that could be a worry. Continued strong hiring and output growth should reassure officials at the central bank that the economy can handle tighter monetary conditions, even if inflation continues to undershoot their goal. The economy expanded at a 5% rate in the third quarter—the best gain in more than a decade—and the unemployment rate fell to 5.8% in November from 7% a year earlier. A fall in energy prices, while dragging down overall inflation, helps consumers in the form of cheaper gasoline and supports broader economic growth. “Having to spend less on gas and energy…it’s like a tax cut that boosts their spending power,” Ms. Yellen said. John Cochrane got a lot of flak for writing An Autopsy for the Keynesians – We were warned that the 2013 sequester meant a recession. Instead, unemployment came down faster than expected. 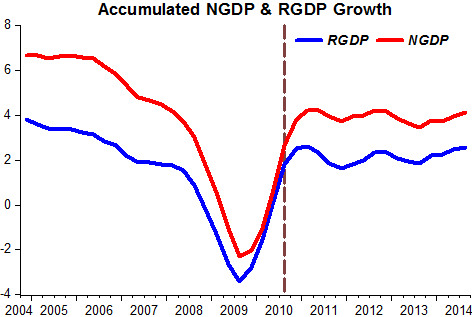 For my part, I never saw a recession, just weaker growth. The GDP data seem to agree with me. 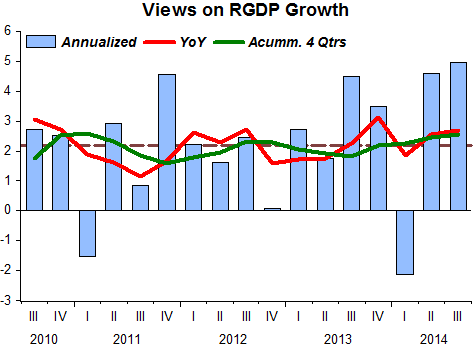 Growth in the first two quarters of 2013 was just 2.3 percent. If we just look at final demand (excluding the buildup of inventories), growth averaged 1.8 percent in the first half of 2013. While the unemployment rate did fall by 1.2 percentage points from December of 2012 to December of 2013, this was largely because of people leaving the labor force. The employment to population ratio did not change over this period. Should us Keynesian types feel embarrassed? 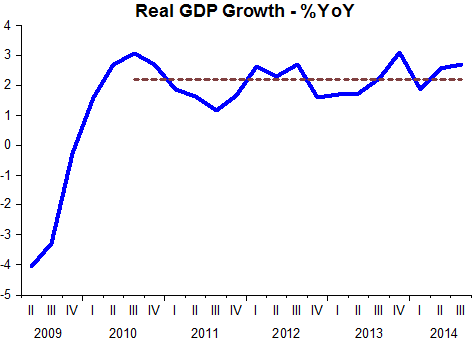 Weaker growth? Since the post-recession bounce-back, average RGDP growth has been 2.2%, very close to growth in the first two quarters of the sequester! The chart illustrates. As I note, sequestration did not have a noticible effect on G — it was anticipated (says my FedGov employed dad) and was a shift in Fiscal 2013 budgets which governed spending for the following 7 months. It didn’t cause a jump in Federal spending. It is impossible to guess when Sequestration occured from the time series of US real G.
In fact, during the recovery, percent growth of real G and real GDP are clearly positively correlated. This is exactly the evidence cited by anti-Keynesians. They are a few data points which form a very clear pattern (with an outlier 2014q1 due to weather). Maybe sequestration did not have a noticeable effect on G. The fall in G had already taken place and as can be observed in the chart, real growth tanked while G was on the rise and kept chugging along at a stable 2.2% rate while it was the turn of real G to take a plunge! 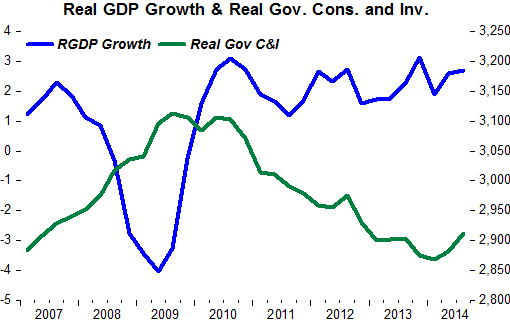 For the whole period depicted in the chart the correlation between real output growth and real G growth is significantly NEGATIVE! By now you have probably noticed an inherent tension between these two underappreciated facts. 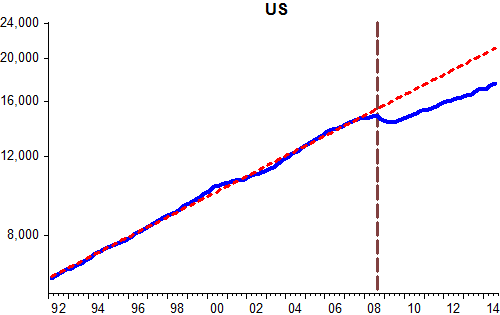 On the one hand, the Fed never intended the expansion of the monetary base under the QE programs to be permanent. On the other hand, the monetary base injections needed to be permanent for the QE programs to really spur aggregate demand growth. 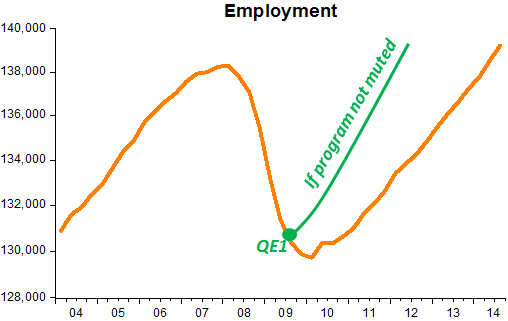 And therein lies the Fed’s dirty little secret: the Fed’s QE programs were muted from the beginning. 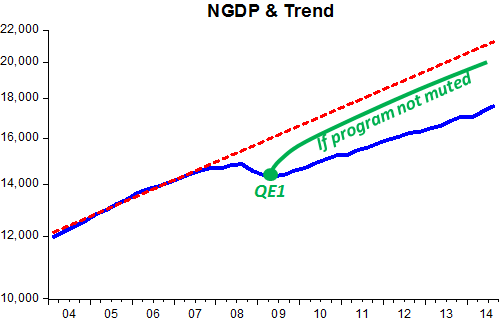 They never could on their own create the amount of catch-up aggregate demand growth needed to restore full employment. So despite all the Fed has said over the past six years, it made an explicit policy choice to avoid fully restoring aggregate nominal expenditures. The Fed, in short, never chose to unload both barrels of its gun. And the QE barrel that it did unload depended on a portfolio channel that could only promise modest benefits at best. Had it committed to a permanent expansion of the monetary base via a level target, the Fed would have unloaded both barrels of its guns and made the QE programs far more effective. Instead, the Fed opted for bird shot when it could have used a slug. This is the dirty little secret Fed officials would rather leave unsaid. 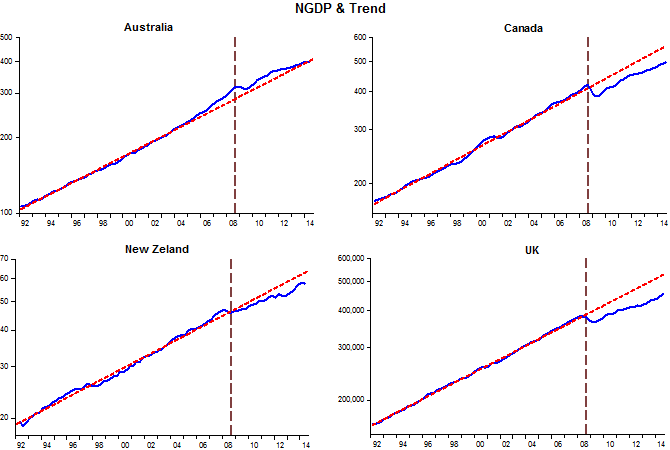 And it´s all very consistent with the outcome for NGDP, which is rising at a level far below where it should be if the Fed had committed to a permanent expansion of the monetary base via a (NGDP) level target! Also, employment remains far below where it could be! The upshot of all this is that you can ignore Yellen´s demonstrations of worries about the plight of the unemployed. The Fed has the economy EXACTLY where it wants it to be! The U.S. economy posted its strongest growth in 11 years during the third quarter, supported by robust consumer spending and business investment. When it comes to describing growth, the annualized rate is not the most illuminating, the reason being its high volatility. Since the bounce back from the 2008-9 “Great Recession”, for the past four years annualized growth has averaged 2.3% with a standard deviation (SD) of 2.0. Meanwhile, the year-on-year growth has averaged 2.2% with a SD of 0.56 and the four-quarter-accumulated rate, a good measure of trend, has also averaged 2.2% with a SD of only 0.31. The following chart shows that growth, both nominal and real accumulated over 4 quarters, have been remarkably stable (low SD) since the bounce-back. 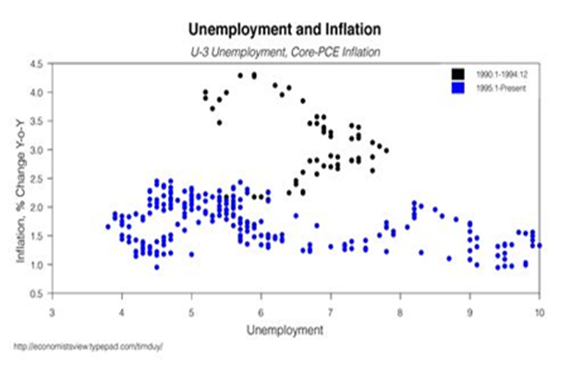 An important chart ran in University of Chicago scholar John Cochrane’s blog recently, and it revealed that at any point in time Wall Street economists predict interest rates will go higher, almost certainly a reflection of inflation fears. I suspect this chart could be fitted out back to the 1970s, and would look the same. I can recall no period in recent U.S. history in which many prominent economists were not warning that higher inflation, often accelerating or galloping, was pending, unless it was when some shrieked above the chorus that hyperinflation was imminent. Let us add another favorite chart of mine, showing that if you want to cut inflation by 1%, then hike the unemployment rate by 5%. With the two above charts, an inescapable conclusion is reached: U.S. economists overestimate inflation possibilities continuously, and wildly overestimate the effect that a robust economy will have on inflation. Why? The answer is not in economics, but in sociology or politics. Surely no thinking profession could be so relentlessly wrong for so long. 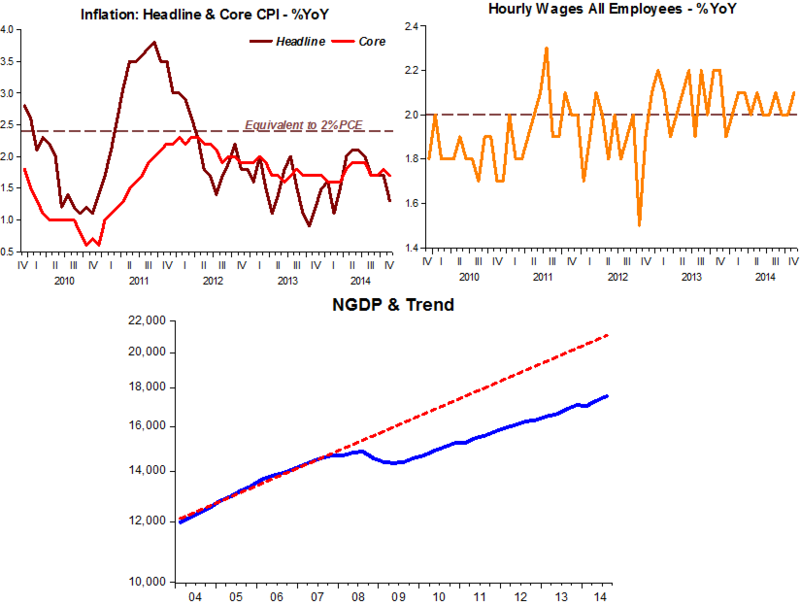 True, the first chart is of Wall Street economists, but few would argue that U.S. Federal Reserve Board economists, or FOMC board members such as Richard Fisher, Dallas Fed President, are anything but obsessed with inflation, and some have even called for a “single mandate,” that is official central bank monomania with inflation. When I look at these two charts I can think only of the millions of workers and businesses that have for years endured weak total demand—and less employment possibilities and smaller profits—due to the chronic upward bias of U.S. economists in forecasting inflation, or the unfounded fear for what a robust and growing economy—and healthy job markets—would mean for inflation. Fed economists and policymakers, in general reflecting professional predilections, have been no different from Wall Street economists. As if another percentage point or two in inflation would mean anything anyway. Perhaps no two other charts capture so much human cost and disappointment, and not for gain, but for nothing. Has the profession forgotten that the purpose of macroeconomics is to promote prosperity? The eagle eye is among the strongest in the animal kingdom, with an eyesight estimated at 4 to 8 times stronger than that of the average human. An eagle is said to be able to spot a rabbit 2 miles (3.2 km) away. Although an eagle may only weigh 10 pounds (4.5 kg), its eyes are roughly the same size as those of a human. As the eagle descends from the sky to attack its prey, the muscles in the eyes continuously adjust the curvature of the eyeballs to maintain sharp focus and accurate perception throughout the approach and attack. San Francisco Federal Reserve Bank President John Williams told Bloomberg Radio Friday that he is already seeing some signs of wage growth, a key metric for a central bank keen for some signs of an inflation pickup as it gets ready to raise interest rates next year. Still, Williams said he fully expects core inflation – which does not include volatile oil or food prices – to be below 2 percent when the Fed begins raising rates. The Fed uses core inflation as a guidepost for where headline inflation will be a year or so in the future; its 2-percent target is for overall inflation. 25 years ago the “seed of destruction” was “planted”! Sometimes, decisions that shape the world’s economic future are made with great pomp and gain widespread attention. Other times, they are made through a quick, unanimous vote by members of the New Zealand Parliament who were eager to get home for Christmas. That is what happened 25 years ago this Sunday, when New Zealand became the first country to set a formal target for how much prices should rise each year – zero to 2 percent in its initial action. The practice was so successful in making the high inflation of the 1970s and ’80s a thing of the past that all of the world’s most advanced nations have emulated it in one form or another. A 2 percent inflation target is now the norm across much of the world, having become virtually an economic religion. And in 2008 explicit and implicit inflation targeting central banks, with the exception of Australia, failed miserably! Much better if they had been explicit NGDP Level targetters to begin with!